A great tool for Land Surveyors, Gammon Reels are an aid to set up with a quick and accurate plumb. 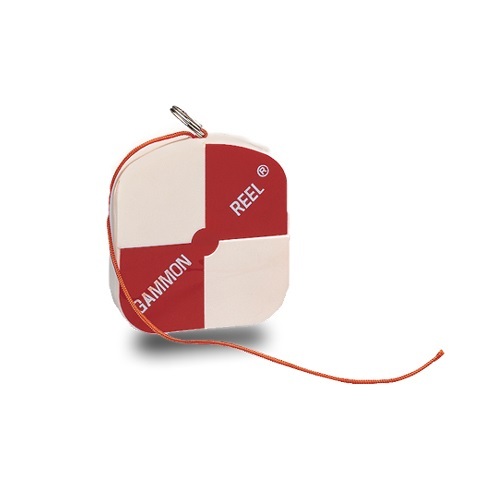 Slip the Gammon Reel into your palm and draw the string to a desired length and stop with finger pressure which will hold the length for you and is easily adjustable during your next tripod setup. Designed for use in the construction field and comes with 12 feet of fluorescent red plumb line. Allowing for simple and fast plumb bob set-up and adjustment. 12 foot plumb line is quickly retracted eliminating tangled, broken and muddy string and reducing neck burns and other plumb line accidents. The fluorescent red Myler protected target also serves as a sight.